Where do I use my RS Components voucher code? At RS Components you can find a huge selection of products including electronic components, power components, connectors, electrical and automation cables, mechanical products and tools, IT components and test and safety equipment from top brands like ABB, Fluke, Schneider, Keysight, Microchip, Panasonic, Siemens, Molex, Tektronix, Omron and many more. Not only do RS Components offer a huge selection of electrical, mechanical and industrial tools and equipment they also provide great services including procurement solutions, inventory solutions, calibration options and a Designspark service. As well as all this, RS Components also provide a ‘new products’ section where you can discover a range of new equipment including engineering materials, batteries, optoelectronics, office supplies, switches, power supplies, transformers and much more. If you’re looking to save money on your items you can always check out the latest offers section. Here you’ll find monthly offers that will guarantee up to 50% off, allowing you to purchase all the tools and components you need for less. 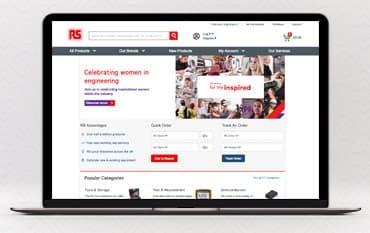 If you are unsure about which product you need for a project then RS Components have a range of selection guides, how-tos and tutorials to help you select the right product from their extensive portfolio. Browse by category and find solution guides on automation, electrical products, electronic matters and innovation. Discover product guides on screwdrivers, self-tapping screws, tape measures, abrasives, eye protection, sensors, single board computers and much more. You can also find guides on cables and thermal camera selection. RS Pro is RS Components own brand that gives you every part you need across all industries at the quality and price you expect. In the RS Pro section, you can find tons of products in the featured categories section including batteries, enclosures, PPE equipment, cables, wires, fasteners, fixings and power supplies. You can also check out the products highlight section where you’ll find thermal imaging cameras, DIN rail PSUs, inverter drives, oscilloscope probes, isolator switches and Ethernet switches. If you’re looking for something really impressive then you can always take a look at the ‘Engineer’s choice’ section where you can discover the latest product that’s been tried and recommended by a top engineer from RS Components. Please note, RS Pro thoroughly test all of their products with leading engineers to ensure they’re always in compliance with industry standards and are guaranteed to provide quality and great performance. Whether it's existing equipment or a new purchase, you need to have confidence in the accuracy of your measurements and that’s where RS Components’ calibration service can help. You can request calibration on existing equipment or when buying new products. If you’re requesting it for existing products, RS will pick up your instruments, whether they were purchased from RS or not, they’ll then deliver your tools back to your site within five working days with certification. If you select calibration on a new item that you’re buying from RS Components then you can expect to receive a certificated calibrated instrument straight out of the box, ready to use. Doing it this way means there’s no hassle or wasted time getting your new instrument calibrated elsewhere and having to raise separate purchase orders. You can select from over 6000 instruments that RS offer calibration options on and can expect them to be dispatched within 2 working days. Free next day delivery is available when you place your order online before 8.30pm Mon-Fri & 4 pm on Saturday. Find more delivery information here. If you're unhappy with your purchase for any reason within 30 days of receiving your products, RS Components are more than happy to arrange the return of your products in line with their terms and conditions. If you’d like to return anything please fill in the return form. Please use the branch finder to find the opening times of your local RS Components branch. RS Components stock and supply all the electrical, mechanical and industrial components you could ever need via their impressive online site. With over half a million products, free next day delivery and tons of branches across the UK, you can rely on RS Components to bring you the tools and services you need. Discover tools, storage, test and measurement equipment, semiconductors, relays, sensors, transducers, PPE and security equipment, all of which is extremely high quality and affordable, made even more affordable when paired with a promotional code from us.